Valdez to appear for talks with audience after two Theater Arts Dept. 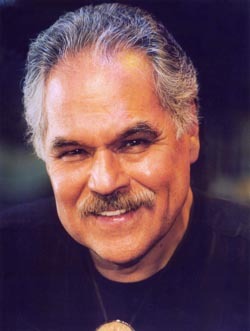 performances of his play, "Mummified Deer"
Luis Valdez is often referred to as the father of Chicano theater. With "Zoot Suit," he became the first Chicano director to have a play presented on Broadway in 1979. Acclaimed playwright, director, and filmmaker Luis Valdez will join his son--UCSC theater arts lecturer Kinan Valdez--for two special post-performance talks at the UCSC Theater Arts Center, February 26 and March 4. 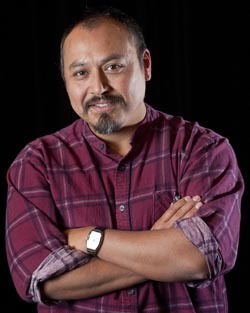 Kinan Valdez, who currently teaches drama at UCSC, is directing an all-student cast in the Theater Arts Department's production of his father’s play, Mummified Deer, running Feb. 25-27 and March 3-6 in the Mainstage Theater. Luis Valdez is best known as writer and director of the 1987 hit film La Bamba, the story of 1950s Mexican-American rock-and-roller Ritchie Valens. He is also the author of the award-winning play Zoot Suit, which ran for nearly a year at the Mark Taper Forum in Los Angeles in the late 1970s, and was later adapted into a feature film which Valdez directed. The founding artistic director of the renowned El Teatro Campesino company in San Juan Bautista, Valdez is often referred to as the father of Chicano theater. 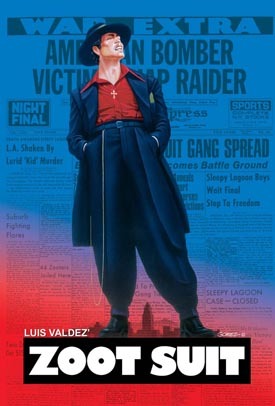 With Zoot Suit, he became the first Chicano director to have a play presented on Broadway in 1979. Luis (the author) and Kinan (the director) will make a special appearance after the UCSC student performance of Mummified Deer on Saturday, February 26, and again the following week on Friday, March 4, to speak about the origins of the play and take questions from the audience. Mummified Deer is a highly personal exploration of a family that moves back and forth in time--from the dawn of the Chicano Movement in 1969, to the 1920s and 30s, to the Mexican Revolution and the genocidal war against the Yaquis in Mexico. "On the surface, Mummified Deer is a family drama about the immediate life-and-death choices one family must make for their ailing and secretive matriarch,” notes director Kinan Valdez. “But at the core, the true family drama is rooted in the catastrophic upheavals of the 20th-century 'American' borderlands." "For the survivors and descendants of this collective trauma, the act of being and becoming family is a process not taken for granted,” he added. “Rather, it’s a perpetual quest to unearth buried roots by sifting through the wild stories of a stubborn, larger-than-life woman of mythic proportions--a survivor of the genocide and diaspora of the Yaqui Nation in Northern Mexico." Kinan Valdez is currently the producing artistic director of El Teatro Campesino and made his directorial debut at ETC in 1994. Since then he has directed numerous stage productions. His film credits include King Lear; I, Priista; the award-winning video short Little Louise; and Ballad of a Soldier, an independent feature film adaptation of Luis Valdez's' one-act drama Soldado Razo. Tickets are on sale now at santacruztickets.com, the UCSC Ticket Office (831-459-2159), and the Santa Cruz Civic box office (831-420-5260).